The purpose of these files is to report weekly the UFO eyewitness and photo/video evidence that occurs on a daily basis around the world and in space. Many people claim it is impossible for UFOs to visit Earth, I ask you only to keep an open mind and watch the evidence we accumulate each week. These Files make the assumption that extraterrestrial intelligent life not only exists, but my hypothesis is that of the over one hundred UFOs reported each week many represent a factual UFO sighting. Articles this week include: General Twining's flying disk memo, Mars lighthouse. UFOs were seen over Arizona, California, Georgia, Kentucky, Maine, Missouri, Michigan, New York, North Carolina, Ohio, Oregon, Pennsylvania, Texas, Utah, Virginia and Washington. Sightings were also reported in Australia, Canada, Brazil, Finland, Mexico, Sweden, and the United Kingdom. Air Material Commands Opinion Concerning "Flying Discs"
1. 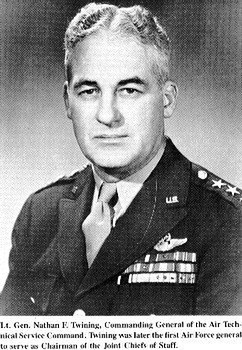 As requested by AC/AS-2 (General George Schulgen) there is presented below the considered opinion of this command concerning the so-called "Flying Discs." This opinion is based on interrogation report data furnished by AC/AS-2 and preliminary studied by personnel of T-2 and Aircraft Laboratory, Engineering Division T-3. This opinion was arrived at in a conference between personnel from the Air Institute of Technology, Intelligence T-2, Office, Chief of Engineering Division, and the Aircraft, Power Plant and Propeller Laboratories of Engineering Division T-3. Editor's Note: While I was giving a speech at the Roswell Museum a young man introduced himself and told me his father had flown alien bodies and debris of the Roswell disc to Wright Field in 1947. He was the co-pilot on Captain Pappy Oliver Henderson's C-54 crew and was convinced this debris was not of this world. BLACK CANYON CITY - The witness saw a stationary, very bright light that looked like a star on May 8, 2005 (Mother's Day). The star started to move very slowly. We were coming home from Flagstaff around 10:15 PM, heading south on I-17 when we noticed the bright star. My passenger said, "Do you think that is a star or a plane?" I immediately saw what he was looking at because it was so visibly bright. As we got closer to it, I could see it was flashing lights, so I figured it was a plane. Then, I thought it couldn't be a plane either because it was moving too slow. I rolled the window down and looked up at it as it was flying over us. I saw 3 distinct lights in a row that were brighter than any other flashing lights I've seen. They were flashing from the right to the left one at a time but very fast. It reminded me of police car lights on the top of the car. I couldn't see what the lights were attached to because they were so bright. As we drove past it I looked back. FALLBROOK - The witness was planting when he looked up at 4:11 PM, on May 1, 2005, and saw a white object shaped liked a barbell. 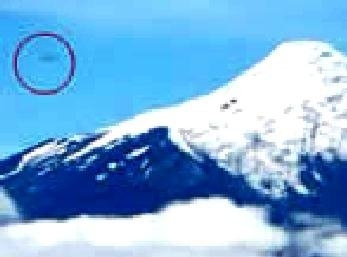 It moving at a very slow speed for a large object and was about 15000-20000 feet up but made no noise. CUMBERLAND -- I was at a party at 1 AM, on May 9, 2005, with four of my friends from college. There were tons of stars because there were no clouds and we were having a barbecue and relaxing. I kept noticing this particular star that seemed to stand out from the rest that looked like it was moving. I turned around to point it out to them, and it moved much closer to us in just five seconds. Its speed was incredible. Everyone was excited at this point and we just watched as it got closer and closer to where we were without noise. After it got to where we were at such mind blowing speeds it slowed to about a 10 mile an hour hover right above the trees that were about 20 feet away from us. These trees are about 50 feet tall, so we had an amazing view of this cigar shaped ship. BLUE SPRINGS - The witnesses report, "At 11:19 PM, on May 6, 2005, my girlfriend and I were heading back from dinner driving south on Highway 7, when something amberish color caught my eye." At first we thought it was a tower light, but it was flickering like it was burning. It was orange like fire and was much higher than a tower. Coming up to Pink Hill Road, it got smaller and smaller like one of those tiny whitish, bluish stars in the sky. Then, it started to move west and it moved closer and we could see flashing red and white lights, just like an airplanes. 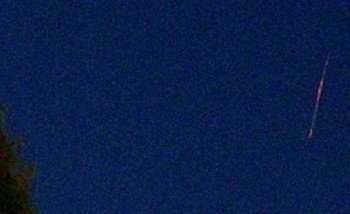 Alan Caviness reports, "This UFO was photographed conducting operations in Davidson County on the evening of May 18, 2005. The same type of object was photographed over a dozen times during the same hour. It was also captured many times during the summer of 2004 from the same property. 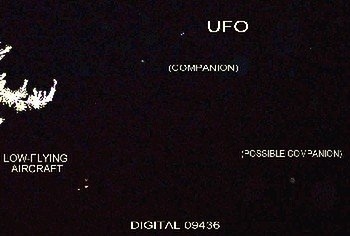 This is a very busy area for UFO craft of various types and their smaller companions that often accompany them. The "companion" UFOs spend a lot of time positioned in the craft's horizontal plane (possibly absorbing energy) but at other times are detected near the ground and the observation team. They are thought to be scouts or probes. Sometimes they get within meters of the field team, but like the primary UFOs, are invisible to the human eye. Intense airplane traffic occurs daily without incident and six members of the field team saw one small white light actually slow down to let an aircraft go past at approximately 10,000 feet. The UFO resumed its speed immediately afterward. 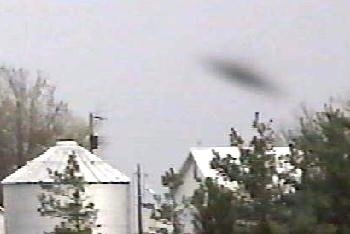 Fostoria - George Ritter's RCA VHS video camera captured this disk on April 18, 2005 over a nearby farm house. The disk appears on only one frame of the video indicating the object is moving at over a thousand miles per hour. Fostoria is located near Lake Erie and near the 41 degree latitude where UFOs are frequently reported. The space shuttle cameras often picked up UFOs moving east and west along this latitude. Morgan Palmer writes, "For as long as there have been cameras, folks have captured on film what they say might be from another world." Or, they say the UFOs might be a secret aircraft the government doesn't want us to know about. Despite the true answer, the fascination with the strange objects in the sky is stronger than ever, mainly because of the internet. B.J. Booth says it's just a great mystery. What is this in the East Texas sky? "We know there are many objects that are seen, photographed, and videotaped by reputable individuals." Booth speaks for a man in Kaufman County -- a man named Larry who doesn't want the spotlight. He just took these pictures, and video. Over the past few years, Booth says his video shows objects that defy explanation. Like a strange white object moving toward a low flying plane. "He was picking up some objects in his camera that he wasn't really seeing or didn't notice when he was taking pictures." Some of the video and pictures are just of strange lights in the night sky -- moving quickly. BEAVER DAM - The witness saw unidentified flying objects last month, and again on May 16, 2005, at 9:30 PM. The UFOs flew over almost exactly a month later, in the same location. 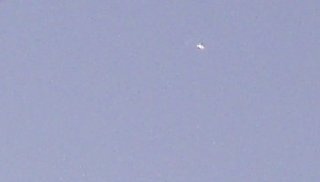 A small white light appeared that moved like a satellite, only much, much closer to Earth traveling towards the southwest at low altitude. It seemed to slow down or even stop. There were no blinking lights but they started to get brighter and got as bright as Jupiter. It reminded me of a plane that is coming in to an airport at night, with all its bright landing lights on. The object changed direction and climbed fast and high, and dimmed quickly. I was able to see it for about 4 seconds before it was too high to see anymore. KIRKLAND - On May 13, 2005, at 12:19 AM, A perfect black triangle with nine orange to yellowish lights on two sides of triangle was seen by the witness. There was a center light at the front tip of the craft with four lights following each leading edge for a total of nine lights. No lights were observed on the stern or rear of the triangle. The color of the lights was a very light salmon/orange yellow. The lights glowed with barely detectible movement similar to air heating phenomena which you see on heated roadways, but in this case the area was confined to the lights themselves. The witness discovered the craft due east in my field of view and the craft was traveling north. I estimate the craft was to 1 mile from my position. I estimated altitude 200-350 feet from ground traveling 70-110 knots "banking" (more like floating) towards the port/left. The craft leveled off traveling towards the NE and became undetectable as it became level, in perfect stealth. The craft seem to "float" like observed satellites float in an arc across the sky, but this craft floated in a straight line close the earth. The size of the craft was as big as a 747 or at least of a football field. Thanks to Russ Hamerly. EMERALD, QUEENSLAND -- On May 6, 2005, at 6:30 PM, a large black object was seen in the sky with red lights at each point. The observers were driving along the highway and looked out the window to see a large black triangle in the sky with red lights at each point. Brazilian Military recognize UFO research A. J. Gevaerd, Editor of the Brazilian UFO Magazine and Head of the Brazilian Committee of UFO Researchers (CBU) reports, "Friday, May 20, was an historic day for Ufology in Brazil and in the world as the Brazilian Air Force (FAB), for the very first time in its history, officially received a committee of top UFO researchers to openly discuss sightings in the country and fully exam classified UFO documents in several military facilities in Brasilia, the Federal Capital." By doing this very important step, Brazilian Air Force (FAB) has placed Brazil in a very short list of countries whose militaries acknowledge the Ufology as a serious activity and significant effort to fully understand the nature and origin of UFOs. "We want to have all info on the subject, that is withheld by us for some decades, fully released to public, through the UFO community", declared brigadier Telles Ribeiro, chief of Brazilian Air Force Communication Center. LONDON, ONTARIO -- At five minutes after midnight, two diamond shaped ships were observed on Tuesday, May 11 2005. The witnessed noticed a purple and blue light in the sky. It was too early in the year for the aurora borealis. The witness looked harder and saw two diamond shaped white moving lights in the center of the purple cloud shape. They were moving in unison and seemed to join together. They went straight north across the sky very quickly and were out of view within in a minute. in a purple cloud. No airplane could move in this way. 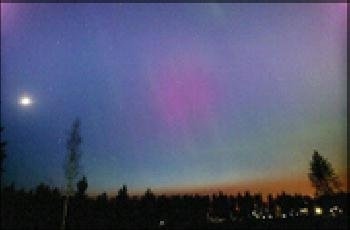 HELSINKI - An enormous fireball of exceptional luminous intensity crossed the skies over Finland in the afternoon, possibly exploding over the border between Russian and Finland on May 18, 2005 at 7:51 AM ET. The information received today was from URSA, the Finnish Astronomical Society. The phenomenon was witnessed by dozens of people in the eastern regions of the country. "Our mathematicians have calculated that the [object] was without any doubt a burning meteorite that came from our western confines and ended with an explosion over Russian Carelia." Translation (c) 2005, Scott Corrales, IHU. You can also go to https://www.paypal.com/cgi-bin/webs cr for majorstar@aol.com. You may use Paypal, Visa, American Express, or Master Charge.